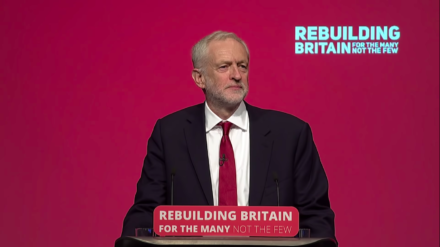 Below is the full text of Jeremy Corbyn’s speech to the Congress of the Party of European Socialists in Lisbon, Portugal. It is a pleasure to be speaking to comrades and friends from other socialist parties and governments across Europe. And not only that, it’s a special privilege to be meeting here in Portugal where a socialist led government, bringing together parties and movements across the left and Labour movement, is successfully turning the tide of austerity and rejecting the neoliberal orthodoxies of recent decades that have failed our people in Europe and across the world. Since I was first elected Leader of our party, the British Labour party, in 2015, I have made building closer ties with our European sister parties and progressive movements across our continent a high priority. We meet at a time of political crisis in Britain when the Conservative government’s failure to negotiate a good Brexit agreement that works for all our people has put our common future in the balance. But whatever the outcome, Labour is committed to remaining a full member of the Party of European Socialists, now and in the future. Inside or outside the European Union, we are internationalists to our very core. As socialists and trade unionists, we will work together to help build a real social Europe, a people’s European socialist Europe, that will strengthen solidarity across borders, resist the race to the bottom in rights and protections and work together to extend them for all workers, consumers and our environment. We have to recognise that EU support for austerity and failed neoliberal policies have caused serious hardship for working people across Europe, damaged the credibility of European social democratic parties and played a significant role in the vote for Brexit in the UK. European socialists have to fight for a different kind of Europe. Our prize is a new progressive economic consensus that breaks with the failed market dogmas of the past and secures shared prosperity built on a powerful public realm. We must build a new Europe, inside and outside the institutions of the EU, that really does work for the many, not the few. Although Britain voted to leave the European Union in 2016, we in the Labour Party will work with you and other progressive parties and movements to improve people’s lives across the continent. In that referendum we argued to remain and reform believing that by staying inside the EU we could help to shift the union towards a more genuinely social Europe, help to loosen the corporate grip on the EU’s agenda and reform some of its more restrictive market driven regulations. But in a country where a million families are using food banks, over 4 million children are living in poverty and real wages are lower today than they were in 2010, a majority of the people voted to leave the EU. We respect that decision – it’s our job to shape what comes next. At the heart of our approach to Brexit is a determination to put jobs and the economy first, to maintain the closest ties and trading relationships, to protect the rights of each other’s citizens, stand firm against xenophobia and racism and promote shared prosperity and mutual solidarity in Britain and across Europe. Unfortunately the Brexit deal negotiated between the EU and the British Conservative government doesn’t deliver anything close to that. It’s a bad deal that will make most British people worse off and risks undercutting rights and standards across Europe. In the past two and a half years the British government has spent more time negotiating with different factions of the Conservative Party than with the EU, setting red lines that reflect no kind of consensus and then systematically crossing them one after another. Now the Prime Minister has signed up to an agreement which has united all the opposition parties and both leave and remain supporters among her own Conservative MPs, against her. As things stand, it looks likely to be rejected next week in the House of Commons. Now facing defeat, Theresa May is reduced to threatening the economic chaos of crashing out without any deal as her best chance of survival. It is a reckless and irresponsible strategy. A ‘no deal’ Brexit would not only do serious damage to the UK but would have unpredictable and damaging consequences across Europe. It must be actively avoided by all sides. A better deal both for Britain and Europe is both desirable and perfectly possible. Further negotiations are a small price to pay to get a solution that works for us all. We are confident that Labour’s alternative plan could command a majority in the British parliament, bring our country together and unlock the negotiations for our future relationship with the EU. A new, comprehensive customs union with the EU, with a British say in future trade deals, combined with a new strong relationship with the Single Market, would strengthen our manufacturing sector and give us a solid base for industrial renewal under the next Labour government, especially for our held-back communities. It would remove the threat of different parts of the UK being subject to separate regulations. Second, a new and strong relationship with the Single Market that gives us frictionless trade and the freedom to rebuild our economy and expand our public services, while setting migration policies to meet the needs of the economy and not fuelling xenophobia with phoney immigration targets, makes far more sense than the Prime Minister’s dismal deal. Finally, we want to see guarantees that existing EU rights at work, environmental standards and consumer protections will become a benchmark to build on, not fall behind and undercut other countries at our people’s expense. These rights and protections, whether on chlorinated chicken or paid holidays, are what people actually want. But the Government is determined to sell them off in a race to the bottom. Labour has very different priorities. Our alternative plan would ensure an open border in Ireland, provide security for investment, give our manufacturing sector a springboard for renewal, ensure we have the powers to rebuild our economy and public services and guarantee world beating support for workers, consumers and our environment. I was looking forward to a head-to-head debate with Theresa May this weekend on her botched Brexit deal to shine a light on what it would mean for our country and lay out Labour’s alternative plan. We agreed to the debate, but unfortunately when it came to it as in our general election campaign last year the Prime Minister backed off and pulled out yesterday. Given that her botched deal would have a major impact on our country’s future and our relationship with Europe, this is the very last time for Theresa May to dodge scrutiny. The Conservatives see Brexit as an opportunity to turn Britain into a deregulated tax haven on the shores of Europe. In the Brexit Withdrawal Agreement the clauses committing the UK to maintain workers’ rights and environmental protections are specifically excluded from the enforcement mechanism. As the British Attorney General boasted in the House of Commons on Monday this gives the UK what he called “flexibility”. But flexibility for whom? Flexibility for employers to exploit workers. Flexibility for big corporate to pollute our environment. Flexibility for multinational giants to undercut the rest of Europe and drive down standards everywhere. Labour stands for the opposite. We want Britain to be a world leader on workers’ rights and on protections for consumers and the environment too. That’s why under our Brexit plan the UK would not only maintain existing standards or keep pace with future improvements in the EU but go beyond them. This is the real social Europe we want to help build. Locking in progressive change irrespective of Brexit. Because we have a common progressive project. And for a taste of what that means in practice we don’t have to look far. It was here in Portugal that the spell of austerity in Europe was broken. After years of being told there was no alternative to cutting public services, slashing wages and selling off public assets, a government was elected in 2015 pledging to “turn the page on austerity.” And despite predictions of doom from all the usual quarters, António Costa’s government has defied expectations and shown there is a better way. I want to pay tribute to the Portuguese left as a whole, the Portuguese Socialist Party and the parties supporting it in government. Because it has been that alliance of progressive forces in Portugal that made it possible to start to turn the tide of failed austerity economics. We need to extend that approach across the continent to create a real social Europe – a people’s Europe that works for the many not the few. Labour’s commitment is summed up in our message: “For the many, not the few”. It embodies an approach to politics that speaks to the large majority representing their interests in opposition to a wealthy and powerful few, who are blocking progress and holding people back. We can no longer pretend that the aspirations of the many can be met without challenging that elite. The model followed by many left-of-centre parties before the great crash of 2008 was based on the calculation that if the powerful forces at the pinnacle of the economy were left undisturbed they would tolerate a measure of redistribution further down the pecking order. That was underpinned by an acceptance of the economic legacy of Margaret Thatcher and Ronald Reagan and a retreat from the idea that governments can intervene to support their citizens from the ravages of global markets. Nowhere was this model embraced more enthusiastically than in my country, Britain. But though that delivered electoral success before the crash, large parts of the population, especially those communities that traditionally voted for socialist and social democratic parties, were losing faith in a system that no longer worked for them. In towns and cities hollowed out by industrial decline and neglect the promised benefits of deregulated markets and privatization sounded like a cruel joke. Where good, well paid jobs were replaced with insecure employment or no work at all, communities – our communities – felt their dignity had been stolen and their pride stripped away. And all the time they watched as the wealth of the very richest ballooned. But when the 2008 crash came the response of the political establishment was to double down and unleash destructive austerity programmes that hit hardest those least to blame for the crisis, multiplying the suffering and deepening the sense of disillusionment. In the post-crash world the model that many social democratic parties had adopted no longer works. The evidence of that has been mounting up in polling stations across the continent for a decade. So when we say we stand for the many, not the few, we are sending a message that we will address the obscene concentration of wealth and power in the hands of a tiny corporate elite. And, we will challenge a failed economic orthodoxy that has fueled inequality and created chronic insecurity in the workplace. Our policies will bring about real change. We not only want a radical redistribution of wealth, we also want to restructure our economy to put power into the hands of workers and consumers. So we will bring utilities into genuinely democratic public ownership. Double the size of the co-operative sector, and introduce mandatory Inclusive Ownership Funds in large companies so that workers get a share of the wealth they create. To the horror of the establishment these ideas are popular. They are helping to shape a new consensus in Britain and well beyond, just as we are learning from your experiences. It’s up to all of us to secure a new economic settlement that breaks from the flawed thinking of the past and creates the real social Europe we all aspire to. The stakes could not be higher. If we cannot rise to the task then we will smooth the path to power of the fake populists. The far right feeds on fears fuelled by falling living standards, damaged communities, insecure work and underfunded public services. It diverts the blame away from the powerful few responsible for economic and social failure and on to minorities. Everywhere its strategy is depressingly familiar: to divide society, to isolate those identified as different, Muslims, Jews, Roma, disabled people, the unemployed anyone whose faith, identity, sexuality, or way of life marks them out. It’s often the most desperate people in society, refugees, who have to bear the brunt of it. On Monday, we will mark Human Rights Day. It will be 70 years since the proclamation of the Universal Declaration of Human Rights, which affirmed the rights of everyone no matter who they are or where they come from. It was a crucial milestone. But sadly the horrors of war, famine and violent occupation have not gone away. There are now more refugees and displaced people in the world than at any point since the Declaration was signed. We must remember that refugees are people, they are people just like you and me. But unlike us they have been forced by violence, persecution or climate destruction to flee their homes. Men, women and children are dying on the borders of Europe. Our criticisms of Donald Trump and Viktor Orban for building walls and putting up razor wire lose their force if we too are raising barriers against those in desperate need. The Right will always find a scapegoat; the Left must find solutions that deliver real change. If the European political establishment carries on with business as usual the fake populists of the far right will fill the vacuum. The biggest issues facing humanity demand that we work together. How else can we confront the destruction of our climate which is creating instability and fuelling conflict around the world? Our planet is in jeopardy, climate destruction is undeniable, sea levels are already rising and the number of natural disasters each year has quadrupled since 1970. The UN Secretary General Antonio Guterres recently said the climate crisis is “a global issue, and we are all failing.” Friends, this makes it even more urgent that we offer people a genuine alternative; united against bigotry, xenophobia and division and for solidarity, internationalism and an economy that allows everyone to reach their potential. A Tory Brexit poses a challenge to all of us but Labour has the values and determination to meet it, based on our determination to cooperate with our neighbours rather than shut ourselves off, and driven by our ambition to build a real social Europe that spans the continent inside and outside the European Union. A Europe for the many, not the few.